AEG members, your membership brings important benefits, so don't let it lapse. 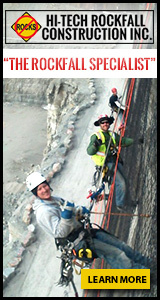 Stay connected with the applied geology community and receive access to all of the benefits of AEG membership by renewing your membership via your member profile (top right). Note: Members must log in to see member pages and access members-only features. If you are not yet a member of AEG, you should be! Sign up for membership today! Register today for the 62nd AEG Annual Meeting in Asheville, North Carolina! The 2019 meeting will feature an opening general session on Wednesday, three full days of technical sessions and symposia, educational Field Courses, fun Guest Tours and exciting special events. The 7th International Conference on Debris-Flow Hazards Mitigation will be held on June 10-13, 2019 in Golden, Colorado, USA on the campus of the Colorado School of Mines. With the beautiful Rocky Mountains covering half the state, Colorado shares the problem of debris-flow hazards with other mountainous areas of the world. Against this backdrop, scientists, engineers, and policy makers from around the world will be able to share new research and ideas in the field of debris flows. To learn more about this event visit dfhm7.csmspace.com/. The Association of Environmental and Engineering Geologists (AEG), Dams Technical Working Group, is proud to present a workshop that focuses on the role and contribution of engineering geologists and geotechnical engineers in the Risk Informed Decision Making (RIDM) process in managing dam and levee safety programs. Risks associated with geological potential failure modes and communicating these conditions to the Risk Assessment (RA) team will be emphasized including the methodology, and implementation of RA for dam and levee foundations. The event will be held at the Denver West Marriott in Denver Colorado on April 24-26, 2019. AEG recently released a high-level summary of the association's new Strategic Plan, which will help guide activities and initiatives for the years ahead. The one-pager includes three goals (below) as well as key objectives to support those goals. A detailed action plan is being rolled out through AEG committees and the Strategic Initiative Coordinators. The 2018-2019 Jahns Distinguished Lecturer is Deborah Green -- find out more. The 2017 Annual Report/2018 Directory of Members is available for members to view online. You must be signed in to view. The latest issue of the Environmental & Engineering Geoscience journal is available for members to view online. You must be signed in to view current and past issues. The latest issue of the AEG News is available to view online. Check out the newest installments of the Geology of the Cities of the World series. Both were released at the 2018 Annual Meeting/XIII IAEG Congress this September. This installment focuses on the Geology of Sacramento. This installment focuses on the Geology of San Francisco.